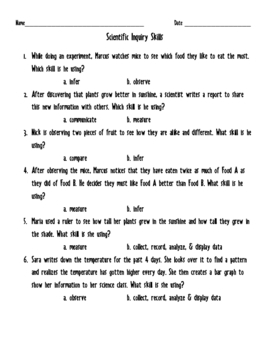 This is a quick quiz I use to assess my students' understanding of scientific inquiry skills such as inference, observation, measuring, analyzing data, etc. It is a quick assessment of 6 multiple choice questions. It is geared for 3rd graders and meets Georgia Performance (GPS) standards for science. If your school uses the GA edition of the HarcourtÃƒï¿½Ã¯Â¿Â½Ãƒï¿½Ã‚Â© science book, it goes with chapter 1.